Interesting facts about chimpanzees, hominid species of apes native to Africa. Habitat, distribution, feeding, reproduction, communication and all the information about chimpanzees. There are two species of chimpanzees, the common chimpanzee and the bonobo. Studies have reveled that humans and chimpanzees share up to 94% of DNA. Habitat, Reproduction, Feeding, Anatomy, Communication, Evolution and more about the common chimpanzee (Pan troglodytes) and the bonobo (Pan paniscus), as well as galleries of Pictures and Videos. Among all primates, chimpanzees are the closest living relatives of humans. Their body, his gaze, and even his actions resemble Homo sapiens, who has managed to unravel some of the secrets of their life. The first thing everyone should know about chimpanzees is that they are not monkeys. They are primates, yes, but they fit into the group of the “great apes,” characterized by their large size and belonging to the Hominidae family. They are hominids, and they lack a tail. The second is that the “Homo sapiens” do not descend from them. Humans and chimpanzees shared a common ancestor a few million years ago, but then man scattered throughout the world, and chimpanzees remained in Africa, the place where they live now. 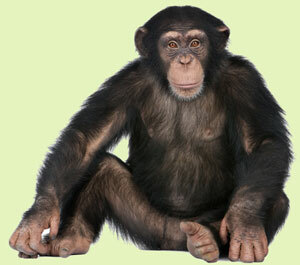 There are only two species of Chimpanzees in the world – the Common Chimpanzee and the Bonobo. The average size for a full grown male Chimpanzee is 150 pounds and 5 to 6 feet in height. There are only two species of chimpanzees: the common chimpanzee and the bonobo, also called pygmy chimpanzee, although it is only a few centimeters smaller than its close relative. Both are part of the genus Pan, and they are very similar physically, and for the inexperienced, it is hard to differentiate them. The key to doing it is to look up: the bonobos’ face is black, rather than the pinkish color that common chimpanzees have in some parts of their face. Why are they so alike and different? Probably the main reason is that millions of years ago, the Congo River separated them. While bonobos developed in the south, common chimpanzees did it in the north, east, and west in a region that today are 21 or 22 African countries. They spend their time in trees with green leaves and fresh fruits, close to rivers and streams. However, some populations do not dwell in these forests or tropical forests, but in savannas or grasslands. Chimpanzees mainly feed on fruits and leaves, but they have an omnivorous diet, which means that they also eat meat to get proteins and fat. They do not stand out as fearsome predators of the jungles, but they are fast, powerful and efficient to hunt small animals, especially species of monkeys and antelopes. There is no doubt that their favorite meal is the termites, and interestingly, it was those insects who led to one of the most important discoveries about chimpanzees. It turns out that in the 1960s chimpanzees were found using stems to catch termites. Primates first defoliated the stalks, which were quite long, and then put them into the hole of the termite nest. After a few moments, they pulled out the stem and ate the termites that had climbing. For humans, it may seem like a relatively simple resource, but back then it was believed that only Homo sapiens could use tools. Now it is known that this is not true. Research on chimpanzees has helped to understand fundamental aspects of their lives. They are highly sociable; they can establish strong bonds with each other, they communicate through vocalizations, gestures, and movements and have the capability to learn from others. All are born in a community, and they do not abandon their mother until they reach maturity. Their intelligence is a matter of continuous interest to scientists and people in general, and there is still much information to be discovered on this subject. The downside of the interaction between chimpanzees and humans is that the latter have affected their lives to some extent. Chimpanzee distribution is smaller than before, their forest habitats keep reducing every day, and hundreds of poachers are lurking, trying to catch one to trade with him. Because of this, all chimpanzees are in danger of extinction. People have the resources to confront the situation. The life of the chimpanzees is valuable, and they have the right to live as they are born: free and in perfect harmony with their habitat. Among all the species in the wild in danger of extinction, without diminishing the importance of other animals, probably chimpanzees are the most significant to us because they share a common ancestor with us.